When you think of homemade Salsa, complicated may be your first thought, especially when it’s so easy to pick up your favorite jar from the grocery store. Most Salsa’s are made by roasting the ingredients to create smokiness and depth in flavor. However thanks to my Mother in law, I have a Salsa Verde recipe that requires no roasting and instead everything is boiled in water and done in 15 minutes, how about that for a easy salsa! The best part is that once you make this Salsa Verde, you can use it for Salsa Chicken, Verde Enchiladas, or dressing for a Burrito Bowl. The base for Salsa Verde is Tomatillos. If you’ve never seen one, they look just like a green tomato, but covered in a husk. I’ve found tomatillos at my local grocery store, usually next to the jalapenos and chili’s. If you’re not using the tomatillos that day, store them in a bowl with no lid, and place in a cool dry place. It’s summer time now, so I placed mine in the refrigerator where they should last a few days. To make the salsa, start by removing the tomatillo from the husk and place in a colander. Rise them very well with water to remove the waxy residue from the skin. 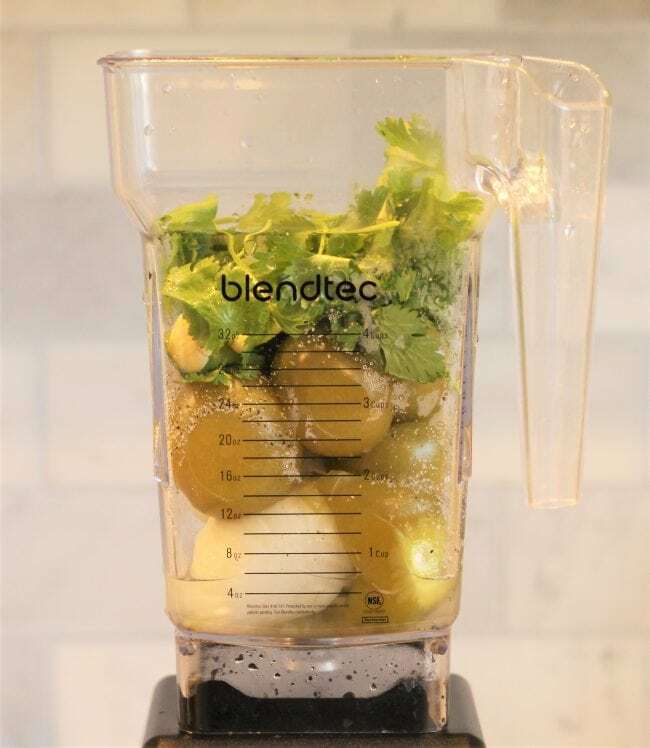 Place the washed tomatillos in a small pot with 1 onion- halved, and 1-2 Jalapenos. Cover with water and boil for about 10 minutes. If you want the salsa to be spicy, boil the jalapenos whole, otherwise you can de-seed for less spice. These peppers are from my garden so they are on the smaller side. Jalapenos can be very spicy or mild, depending on the crop. You can always slice a little piece and do a taste test, if you’re brave! Using a slotted spoon, transfer all the ingredients to a blender and add about 1/2 cup of the cooking liquid. Add a handful of cilantro, 2 raw garlic cloves, and salt/pepper. Blend well and taste for seasoning. Pour into a jar and place in the refrigerator to cool down. Salsa can be stored in a airtight jar for about a week in the refrigerator. But you’re going to want to put this on everything so it probably won’t last that long! Remove husk from tomatillo and place in a colander. Rinse well to remove waxy residue from skin. 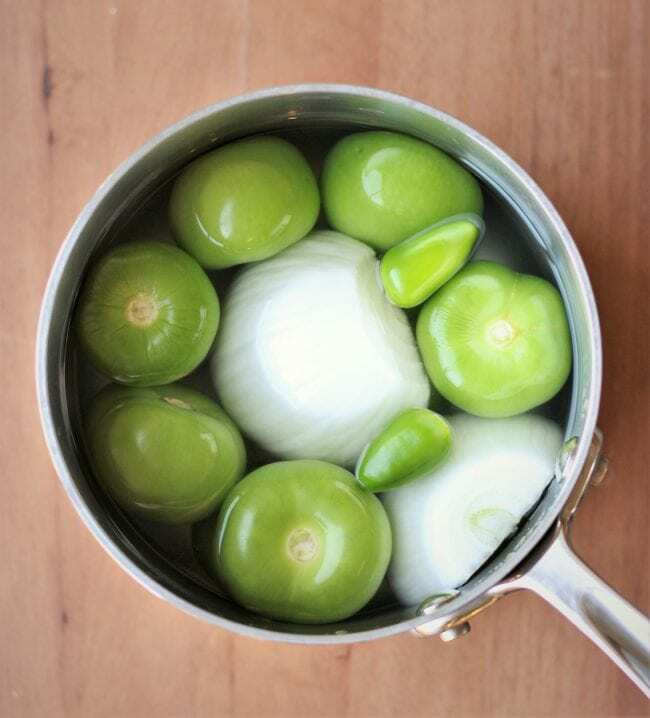 Place rinsed tomatillos in a pot with halved onion, and jalapenos. If you want the salsa mild, then de-seed the jalapeno. Cover with water and boil for a bout 10 minutes, till they soften. Place in a blender with about about 1/2 cup of the cooking liquid, and add a handful of cilantro, 2 raw garlic cloves, and salt/pepper. Blend well and taste for seasoning. You can also add canned green chiles afterwards to make it chunkier, or once cooled, add diced avocado. Store in air tight jars in the refrigerator up to 5 days or freeze if needed. Thank you for the recipe! Homemade food is always the best, especially if the vegetables are from your own garden!